The GPS Show Daily was the publication circulating the show floor at the Global Petroleum Show 2015. The launch of the TeQ™ Shield confined space monitoring technology made it to the cover. The GPS daily reporter attended the launch and met with Lee Whittaker (United Safety’s CEO) who said “it’s very exciting and it’s great to assist our customers in executing these critical tasks”. Shayne McCallum (VP for Canada), explained the reporter how the technology works, combining video surveillance, communication, gas detection and access control, all run from a command center. 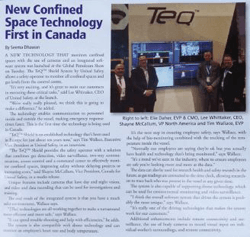 Tim Wallace (EVP Americas) mentioned this is the first time a technology like the TeQ Shield is used in Canada, and it can help make turnarounds safer and more efficient. Tim Wallace finishes by discussing additional enhancements such as drone technology and bio-monitoring, and the future of data in the safety industry.